Right: photo by Gillian Harvey. Left: specimen collection numbers PTM 458 and PTM 466 in the UBC Herbarium Algae Database. Search the collection numbers in the database for more information on these specimens, or search the species for further occurrences. Images courtesy of Sandra Lindstrom. 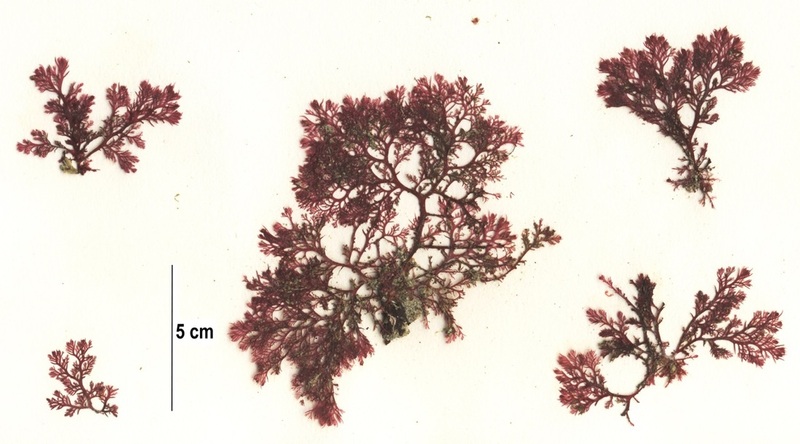 This delicately branched, feather-like red algae can grow up to 25 cm in height. Several main stems, from which numerous side branches develop, can be up to 2 mm wide, and grow in a zig-zag pattern. The tips of the side branches tend to be pointed and curved. The holdfast is typically disc-shaped, but can also arise from a creeping rhizome-like structure that grows along the substrate. You may find this shiny, almost translucent deep purple-red species as a single plant, or growing in clumps, but not in extensive mats nor epiphytically. At first glance, Microcladia coulteri is similar in appearance. 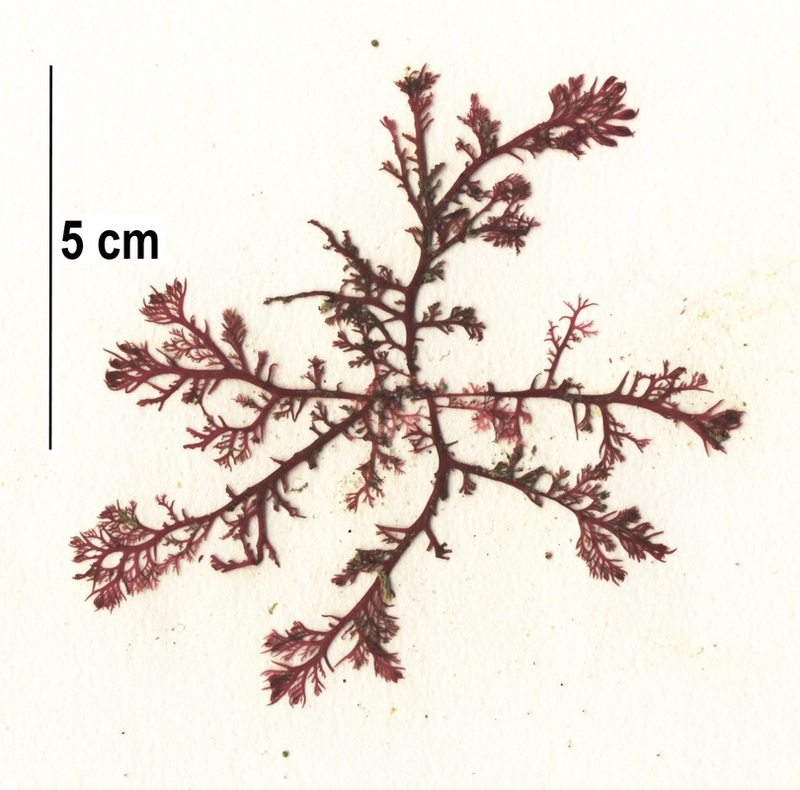 However, M. coulteri is usually smaller, and found growing on epiphytically on other seaweeds. The main stems of M. coulteri are also straighter than the more zig-zagged main stems of Plocamium pacificum. This species has an extensive range, that not only includes the north eastern pacific from northern Alaska to northern Mexico, but also includes Chile, Galapagos Islands, New Zealand and parts of the north Atlantic Ocean. 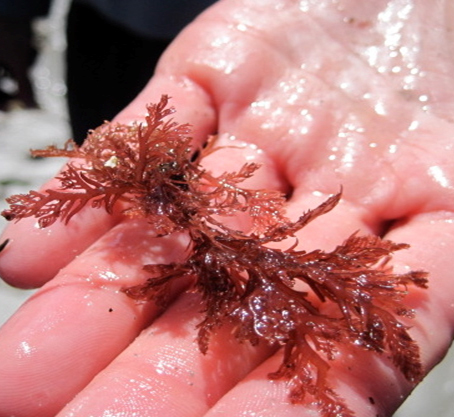 It grows attached to rocks that are partially buried in the sand, in tide pools and throughout kelp forests from the low intertidal to 40 m.
O'Clair, R. and Lindstrom, S. Plocamium pacificum (Kylin). In Klinkenberg, Brian. (Ed.). E-Flora BC: Electronic Atlas of the Plants of British Columbia. Lab for Advanced Spatial Analysis, Department of Geography, University of British Columbia, Vancouver. Accessed 2015-11-10. Watanabe, J. (2010). Plocamium pacificum. In Seanet: Common Marine Organisms of Monterey Bay, California. Accessed 2015-11-10.